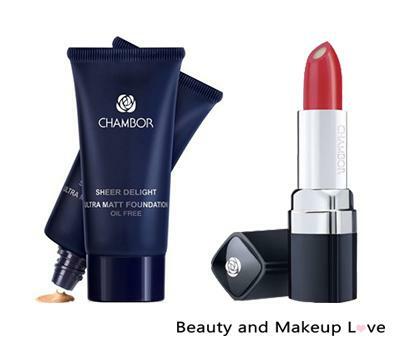 Chambor started with the belief – “Every woman is inherently beautiful & make up will just enhance their natural beauty”. 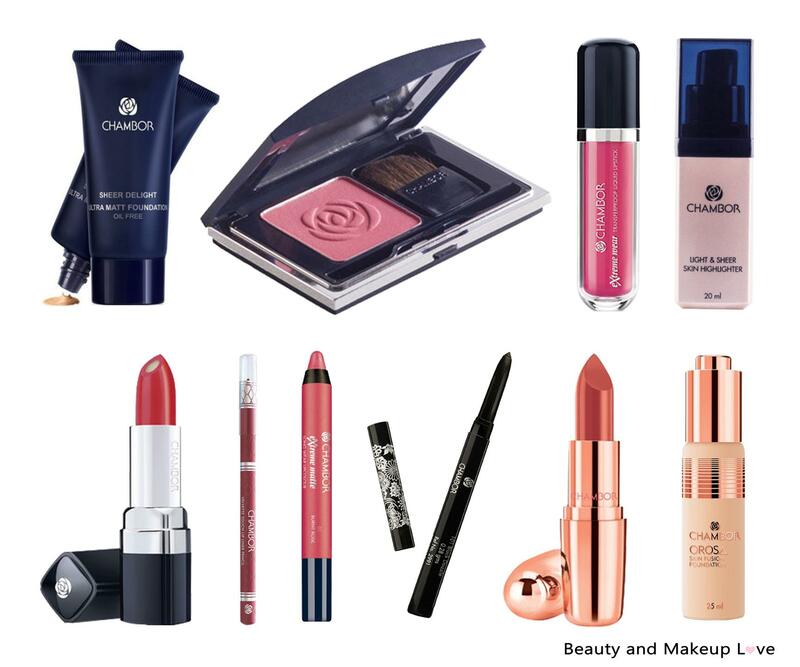 It is a cosmetic brand from Switzerland that launched its first product in the Indian market in 1993. Over the passage of time, it has become extremely popular with the quality products and with the constant new launches, it has become one of our cult favorite brands as well. Chambor is very famous for their range of lip colors, ranging from glossy to matte. The quality of every makeup is impeccable and there is no inclusion of animal ingredients. Nowadays, it is also easily available online with an exclusive launch on Nykaa. We have listed the 10 best chambor products along with their prices and mini reviews. If you love liquid lipsticks, you have to try this out. Chambor Extreme Wear Transfer Proof Liquid Lipstick comes in a sleek tube packaging and the flat, stretched applicator that is fairly easy to use makes it even more convenient. It is available in 18 shades – mostly reds, few pinks and oranges. The texture and consistency are very creamy and feels smooth and easy to apply. The color payoff is excellent and they provide opaque, even color coverage to the lips. It takes some time to turn completely matte but when it does, it looks elegant and doesn’t dry out the lips or accentuates the fine lines. They do last remarkably long on the lips (around 6-8 hours) and is one of the most affordable liquid lipsticks in India. The Chambor Orosa Lipstick comes in 24 stunning shades which is amazing. 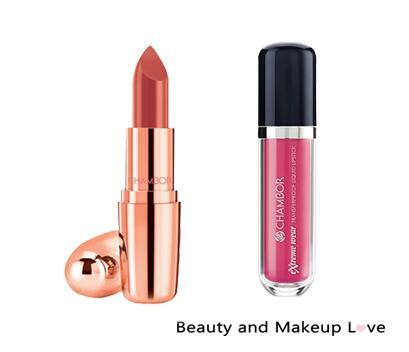 The lipsticks are encased in a luxurious rose gold packaging and are lightweight. It is formulated with antioxidants and vitamins, it visibly reduces lip creases with every application. The lipsticks are creamy and hydrating and the buttery formula allows to glide on the lips smoothly. It has a non-drying matte formula and feels very comforting. The pigmentation is great and they impart enough pigment to the lips to cover up uneven lips. These are long-lasting and stays for around 4 hours approximately without eating. The Chambor Sheer Delight Foundation is the perfect pick for oily to combination skin. It comes in an opaque dark blue tube and has only three shades – Natural, Ginger, Ocher. The texture of the foundation is extremely thick but it doesn’t have the rich slippery feel of a cream at all. It is very easy to spread on the skin and feels oil free and light as well. The coverage is sheer-to-medium and it feels like my skin but better. The foundation has more of a velvety-matte finish and does not oxidase on me and has quite decent oil control as well. The staying power is around 6-7 hrs. The Chambor Powder Matte Lipsticks are available in 18 beautiful shades. The lipsticks are housed inside a black glossy casing with the twist up function. The texture of the lipsticks are not exactly creamy but the formula is so soft and beautiful that it glides on the lips like a dream. Every shade is well pigmented and deposits the right amount of color and doesn’t bleed or feather at all. The finish is powdery matte but it will never accentuate the fine lines or dryness. It feels so light and comfortable and stays on the lips for 4-5 hours without fading. Considering the price point, the range is wonderful. 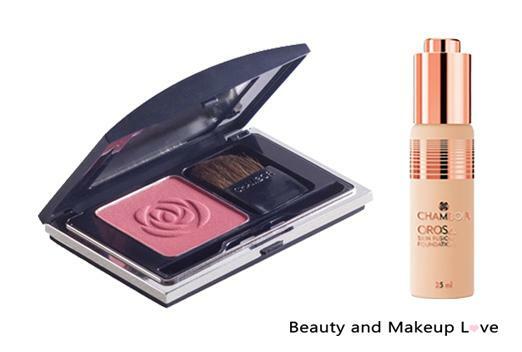 Chambor blush is one of the must have products from Chambor and is also a best-seller of Chambor. The blush is a visual treat as it comes with a Chambor logo (flower) print, the blush also comes with an in-built mirror which is quite handy. The blush comes in 6 different shades and there’s a shade for everyone in the range as the shade range varies from baby pink to coral to brown to maroon which is sure to suit all skin tones. The blush has a soft texture which goes pretty smooth n the skin, one or two swipe and it’s super pigmented. The blush lasts pretty good, for around 5-6 hours! Chambor Orosa Skin Fusion Foundation is available in 4 shades – Ivory Fair, Ivory Natural, Ochre Neutral, Ochre Deep. The foundation comes in a slim frosted glass bottle with a dropper. The foundation has a very thin, runny texture which blends very easily into the skin due to the presence of silicones and settles down to a luminous matte finish and has a slightly powdery feel to the skin as well. The coverage is sheer to buildable and a perfect pick for everyday wear. It also improves elasticity and firmness while visually minimizing the pores. The foundation has SPF 15 and the wear time is around 8-9 hrs. 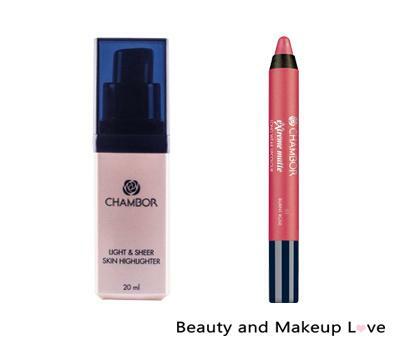 The Chambor Light And Sheer Skin Highlighter comes in an opaque pump bottle with a dark blue cap. The texture of the highlighter is like a slightly thicker lotion and it spreads and blends on the skin without any issues and gives a beautiful sheen to the skin. The shimmers are refined and reflect right amount of light as well. It makes the skin glow beautifully and gives a healthy, plump, luminous looking skin. The formula is good and sets on the skin. The staying power is around 5-6 hrs. The Chambor Extreme Matte Long Wear Lip Color are one of the best lip crayons in the market. These are available in 15 shades only, but perfect pick for red lovers. The crayons have a smooth, easy and creamy texture that glides like a dream, but settles into an extreme matte finish. However, it will not make you feel uncomfortable or transfer heavily at all. It has the ability to survive meals as well. The staying power is around 8-9 hrs with impeccable pigmentation. Also the crayons are free of mineral oil, paraffin, parabens and animal ingredients. The Chambor Velvet Touch Lip Liner Pencils are available in 8 shades. These pencils come in a wooden form that needs to be sharpened. It has color coded body and light weight too. 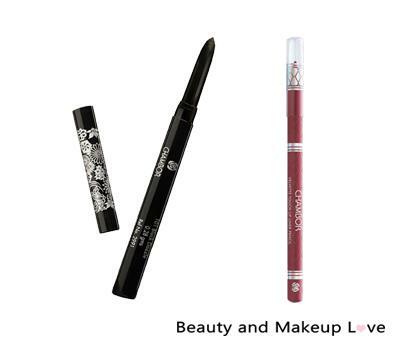 The pencils are extremely creamy, smooth and glide on the lips easily. They are richly pigmented and helps in preventing the bleeding or feathering of lip color. These are surely long-lasting and helps to elongate the staying power of the lip color as well. Chambor Dazzle Eye Liner Pencils are available in 9 stunning shades and is considered as one of the best eye pencils in India. The pencil has an attractive retractable packaging and color coded as well. The texture is creamy smooth and soft and glides on the eyes effortlessly. The pigmentation is good and deposit rich amount of color as well. The finish is matte and the formula is smudge proof, waterproof and dermatologically tested as well. The staying power is around 6-7 hrs. Previous Previous post: List of Paraben Free Brands in India – Go The Natural Way! Next Next post: Top Winter Fashion Essentials For Women!